Organisms known as protozoa include a wide range of organisms, most of which are free-living single-celled eukaryotes. Therefore, protozoa fit into the Domain Eukarya. Although the different phyla of the kingdom Protista are not closely related, they are nonetheless classified together because of their large differences from the other kingdoms of plants, animals and fungi. The name “protozoa” has a dynamic history, at one time including only the “animal-like” unicellular forms of life. Today, these heterotrophic protozoa are lumped together with the autotrophic algae and other simple forms of life into the Kingdom Protista. While all protozoa are eukaryotes, not all reproduce with the standard model of mitosis that is seen in higher animal cells. Many have complex cellular division that resembles binary fission in bacteria, on a larger scale. Some phyla in the Kingdom Protista are autotrophic cells, containing chloroplasts which can produce sugars from sunlight. Although only heterotrophic organisms were considered protozoa historically, this article will present many of the phyla within Protista that can photosynthesize sugars. Below is an image of a ciliate protozoa. Malaria is a disease that effects hundreds of millions of people worldwide, every year. It is estimated that malaria kills three million people a year, half of which are young children. Malaria is caused by several protozoa in the genus Plasmodium. This particular protozoa carries out life cycles in both the digestive systems of mosquitos, and in human blood cells. The unicellular protozoans enter the bloodstream of humans during a mosquito bite. They find an uninfected red blood cell, and use a special combination of organelles at the end of their cell to force the cell to draw the parasite in. This special group of organelles, known as the apical complex, allows the parasitic protozoa to hide within blood cells. This makes Plasmodium and other parasitic Apicomplexans very hard to kill, as the blood cells would have to be destroyed as well. An interesting phenomena in the ocean is also caused by another phylum of protozoa. The Dinoflagellates are a group of protozoa that exist mainly as free-swimming unicellular organisms, while other exist symbiotically within certain invertebrates. Groups of dinoflagellates that are free swimming can undergo drastic periods of reproduction, known as blooms. If a bloom produces enough dinoflagellates, the ocean water will become pink or even red because of their density. Unfortunately for any organism that passes through the bloom, dinoflagellates produce a toxin. When congregated in enormous densities, this neurotoxin can paralyze and kill almost any organism in the bloom. Fish, crustaceans, and mollusks that eat the bloom may store the toxins in their tissues and become poisonous to people who eat them. Paralytic Shellfish Poisoning is the caused by dinoflagellate toxins in high concentration. Simple protozoa, in high numbers, can cause muscle paralysis and respiratory failure in humans, possibly leading to death. There are many phyla in the Domain Protista. While this represents a wide variety of them, it is not close to all of them. Part of the reason there is so much diversity in this domain is that the phyla are not closely related. 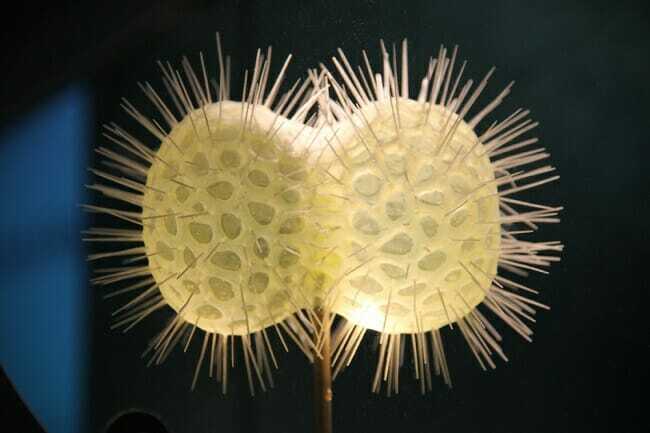 The Euglenida are a phylum of protozoa recognized by the pellicle that gives them shape and the flagella which they use for locomotion. The pellicle is a shell of sorts that exists beneath the cell membrane. It is composed of strips of proteins, which interlock for support. Some organisms in the Euglenida are photosynthetic, and contain chloroplasts. Others obtain food from dissolved nutrients in the environment, while still others are parasitic. Closely related to the Euglenida, the Kinetoplastida are also protected by a pellicle, although it is made exclusively of microtubules. Organisms in the Kinetoplastida share the unique characteristic of having a single, much enlarged and elongated, mitochondrion. Typically, cells have many small mitochondria, as opposed to one large one. The Kinetoplastida includes many parasitic organisms that cause disease in humans. Of these, leishmaniosis is the most notable, affecting over a million people a year. However, advances in medical treatments saves most of those infected, and only around 1000 people die annually from these protozoa. Instead of flagella for locomotion, organisms in the phylum Ciliophora use much smaller structures called cilia. The cilia of these organisms cover their entire cell, and work together to propel the cell forward. Much like the individual paddles of a row boat, each cilia gives a forward moving power stoke, then whips back to the starting position in the recovery stroke. Organisms in the Ciliophora include a wide variety of body plans, including free-swimming organisms and sessile organisms that use their cilia to filter food from the water. Most ciliates exist on the bottom of marine environments, known as the benthic zone. However, these protozoa have also specialized as parasites in the digestive tracts of larger organisms. As seen in Example #1, the Apicomplexa include mostly parasitic organisms that exist solely within their host organisms. These organisms all have apical complexes, which allow them to gain entry into their host’s cells. Inside the cells, the parasites are much more resistant and have better access to nutrients. Many of these parasites can also change the proteins exposed on the surface of their cells. This helps them “hide” from the immune system cells, which recognize foreign cells on the surface of invading pathogens. This makes it very difficult to treat medically. Seen in Example #2, the dinoflagellates use flagella to locomote and are also covered by a pellicle. Unlike the two previous groups with pellicles, the dinoflagellates use a series of vesicles beneath the cell membrane to create a rigid form. Some dinoflagellates even fill their vesicles with polysaccharides, like cellulose, to create a form of armor that protects their cells. The Stramenopila includes a wide variety of organisms, from the shelled diatoms to brown and golden algae. Protozoa in this phylum have shells, scales, or tests that support the cell. These protective covering vary widely across the phylum. The diatoms tend to make ornate and complex tests of silicate, which is also used to make glass. Others form their shells from calcium carbonate or protein. The phylum Rhizopoda contains the amoebas. The small, unicellular protozoa are some of the only protozoa that do not have any sort of hard covering. The amoebas move by extending their cytoplasm into the environment. These extensions are called pseudopodia. The Granuloreticulosa includes a variety of organism that have immense industrial value. The tests produced by these protozoa aggregate in huge numbers on the bottom of marine environments. Over time they fossilize together and become substances like chalk, limestone, and marble. Even the pyramids of Egypt were built from stones that originated from the shells of these protozoans. The Diplomonodida are a phylum of organisms that have many flagella for locomotion. The average number is around 8. While there are many species that vary in their place in the ecosystem, the most well-known of these protozoa is the genus Giardia, which can be consumed in unclean water and cause flu-like symptoms and diarrhea in humans. These organisms contain many flagella, up to thousands on a single cell, and have a special fiber that attached the Golgi apparatus to the base of the flagella. Many parabasilids exists as symbiotic protozoa in the digestive tracts of insects, particularly those that eat wood. These protozoa are able to secrete an enzyme that can break down cellulose. Several other phyla of protozoa exist, but cannot be covered here. Like all other protozoans, these organisms lack specialized tissues or layers of cells. Most are unicellular, although some exist in colonies or fibers. Due to their small size an adaptability, the protozoa have occupied nearly every environment on the planet. Metazoa – Organisms that have organized tissues, unlike the protozoa. Protist – A name that reflects the addition of photosynthetic organisms into the unrelated group of protozoa. 1. A scientist is watching an unknown organism develop. As the cells divide, they begin to form distinct tissue layers. Which of these describes the organism? B is correct. The protozoa, although some do exist as multi-celled organisms, do not have distinct tissue layers, and are often seen as colonial individuals living together. In the Metazoa, tissues are distinguished from each other. 2. An organism under the microscope is seen to be free-swimming, single-celled, and covered in tiny hairs, that move about. What phylum does this protozoa belong to? C is correct. 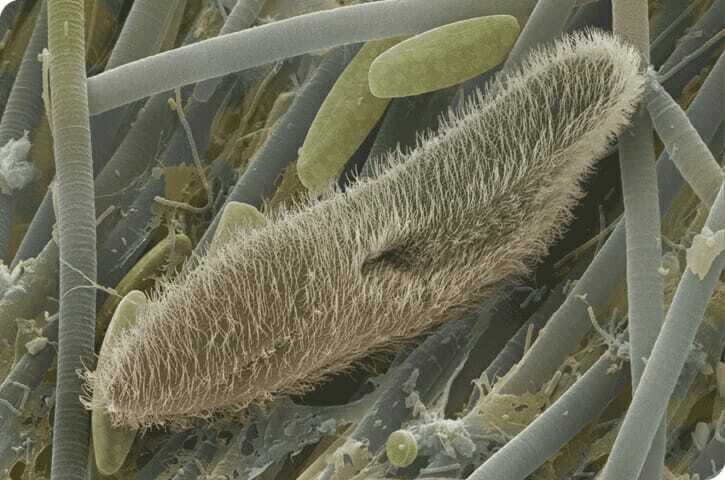 The organisms in Ciliophora use the tiny hairs known as cilia to move around. Currents generated by the many tiny hairs have enough force to move the organism quickly through its environment. The other phyla listed as answers do not have cilia. 3. A scientist takes a scoop of pond water and examines it under the microscope. He sees many tiny organisms in the sample. Are all the organisms protozoa? C. Everything except the fish! B is correct. Even on a microscopic level, there are many species that may look like protozoa, but are actually complex organisms with multiple cell layers. On the other side, many bacteria exist in a scoop of pond water, and are part of the domain Bacteria, not Protista.